Creamy mayo mixed with gochujang (a popular sweet and spicy Korean condiment) and tangy dressed radishes are the perfect garnishes for our porterhouse strips and pak choy. 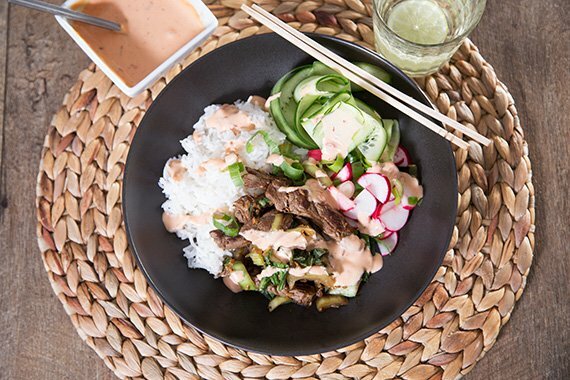 Fluffy jasmine rice and cucumber tops it all off for a delicious mid-week meal. Share the moment #youplateit with us on Instagram. In a medium pot, bring 1 cup water to a boil. Stir in the rice; cover and reduce the heat to low. Simmer for 15 minutes until all of the water is absorbed. Taste the rice; if it is still too firm, add a few more TBS of water. Cover the pot and let the rice absorb the water off of the heat. Fluff the finished rice with a fork. While the rice cooks, wash the fresh produce. Cut and discard the root end of the pak choy and thinly slice. Halve the radishes, then thinly slice. Thinly slice the spring onion. Peel and mince garlic and ginger. Using a peeler, peel long ribbons of cucumber. Pat dry steak with paper towel and cut into ½ cm stir fry strips. In a bowl, combine radishes, spring onion (to taste, save some for garnish), rice vinegar and sesame oil (to taste - it is quite a strong flavour). Season with salt and pepper. Toss to combine, then set aside. Heat olive oil (enough to cover base) over medium-high until hot. Add ginger and garlic, cooking for 30 seconds - 1 minute minutes, until fragrant. Add beef and continue to cook, stirring frequently, 4 - 5 minutes, or until lightly browned. Add soy sauce and pak choy. Cook 1 - 2 minutes, or until combined and the beef is cooked through. Turn off the heat. Taste, then season with salt and pepper if desired. In a bowl, combine the mayonnaise, 1 tsp of water, and gochujang (it's spicy, so add as much as you’d like, depending on how hot you like it). (TIP: We suggest keeping some plain for those who don't like it hot). Taste, then season with salt and pepper as desired. Divide rice between bowls. Top with beef, pak choy,dressed radishes and cucmber ribbons. Garnish with remaining spring onion and drizzle over gochujang mayonnaise. Enjoy!